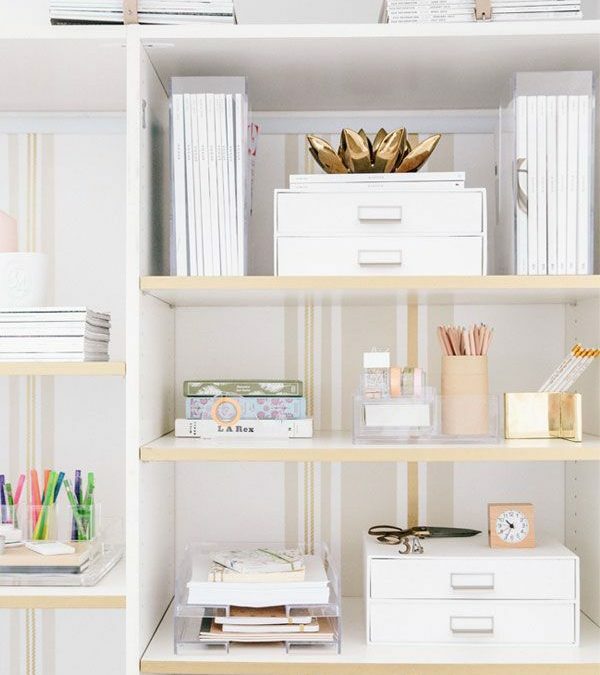 We all love great small apartment hacks and here’s one that requires little effort: how about re-arranging your bookshelf to instantly prettify your space? 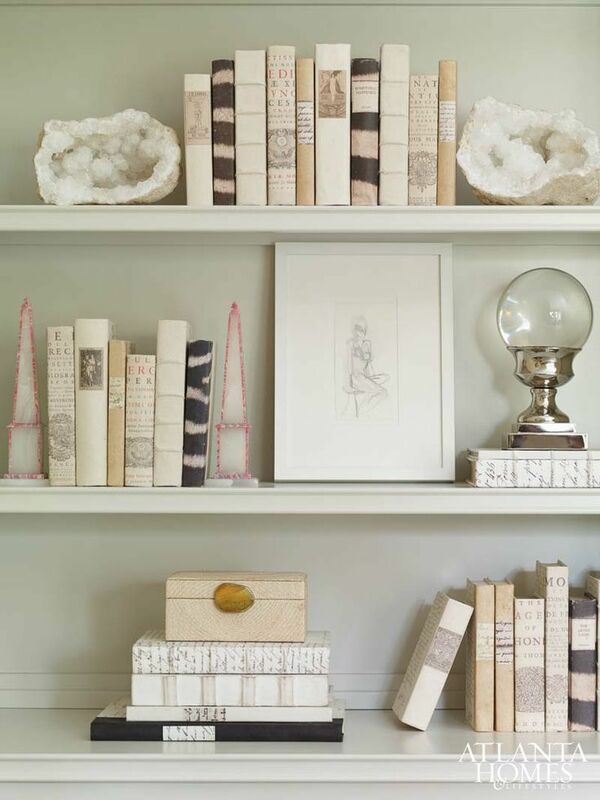 A bookshelf could work as a focal point of a room when styled right. 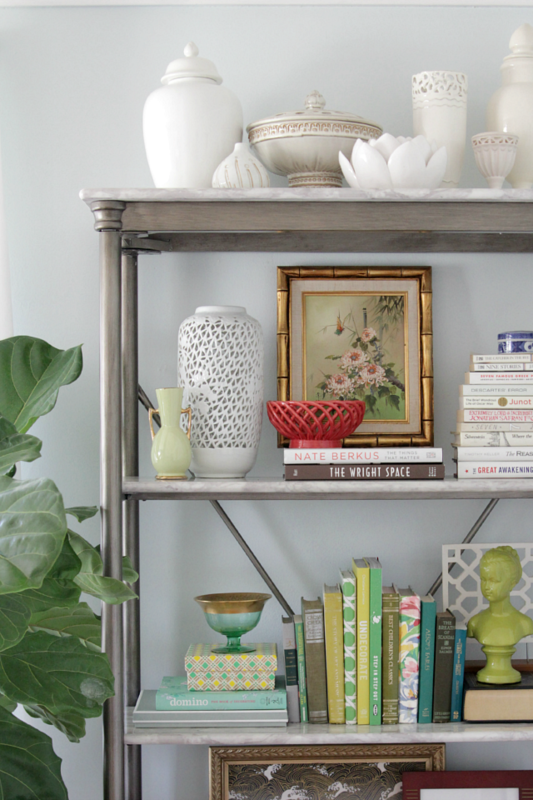 Curate your bookshelf by adding items on the shelves that add cohesiveness to the space. Instead of displaying random bits and bobs on your bookshelf all at once, highlight items with similar physical characteristics. For instance, add several same-color ceramic urns and vases on the bookshelf together with your books to bring a cohesive sense to the space. You could also create a sleek monochromatic look with a few well-chosen decors. 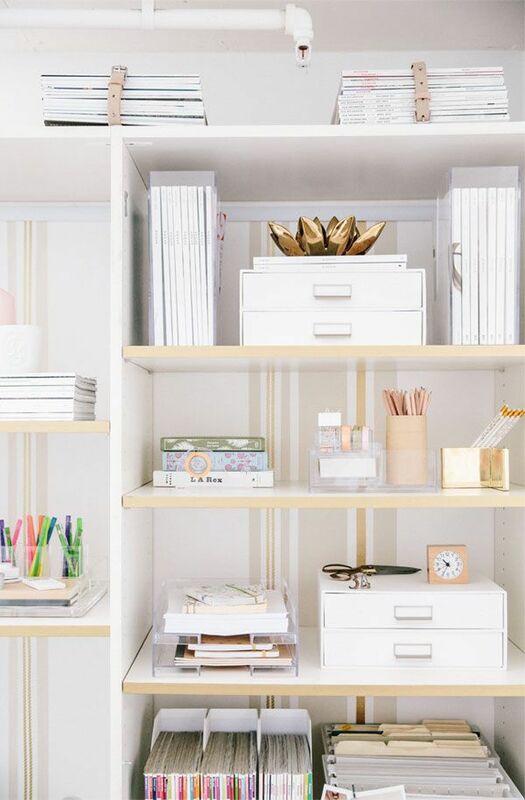 Whenever you highlight a collection in your bookshelf, remove items that are making the shelves look busy. 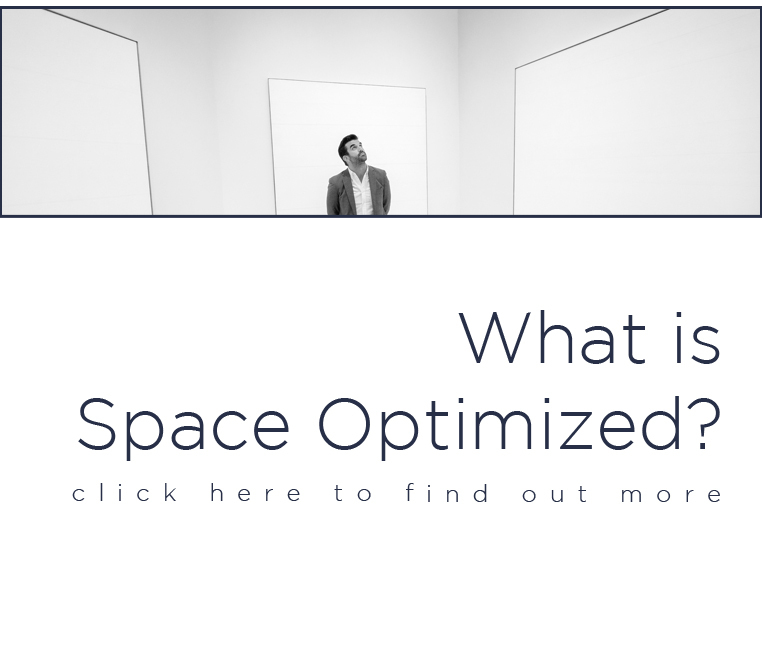 Edit the space and spread out statement pieces to harmonize the space. To break the monotony, try adding a single focal point on the shelves. The anchor piece will pull together the whole look. 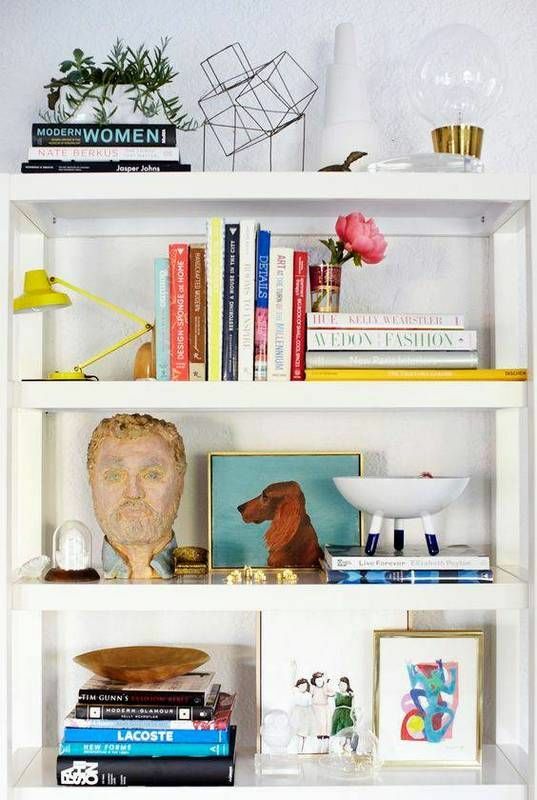 Another trick that adds order to a chaotic or bland bookshelf is to group the items on display by color. Now, some are not keen on curating the bookshelf by color but it’s really a great way to build an eye-catching bookshelf. Start by picking a color theme – like blue, for instance – and then start adding decors in varying shades of blue. From navy to baby blue, the color variation will add dimension and personality to the space. 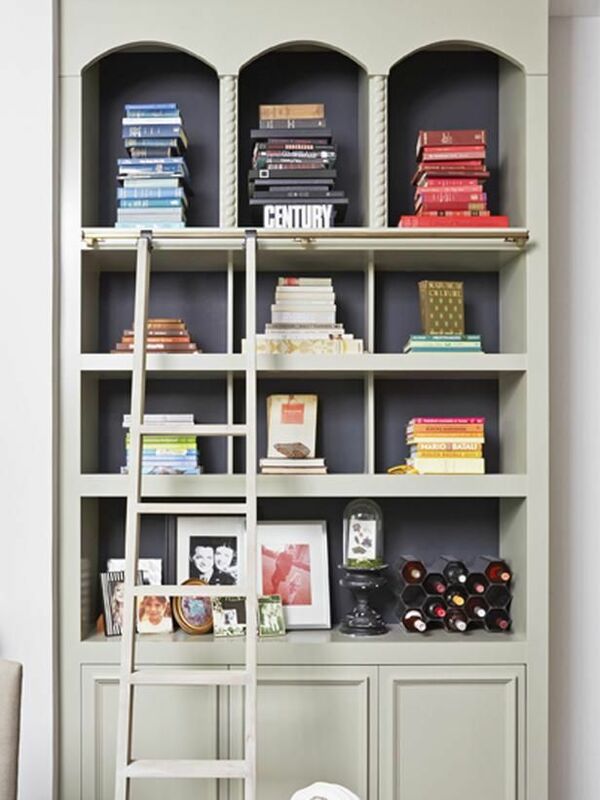 Styling by color gives a sense of organization to the bookshelves. 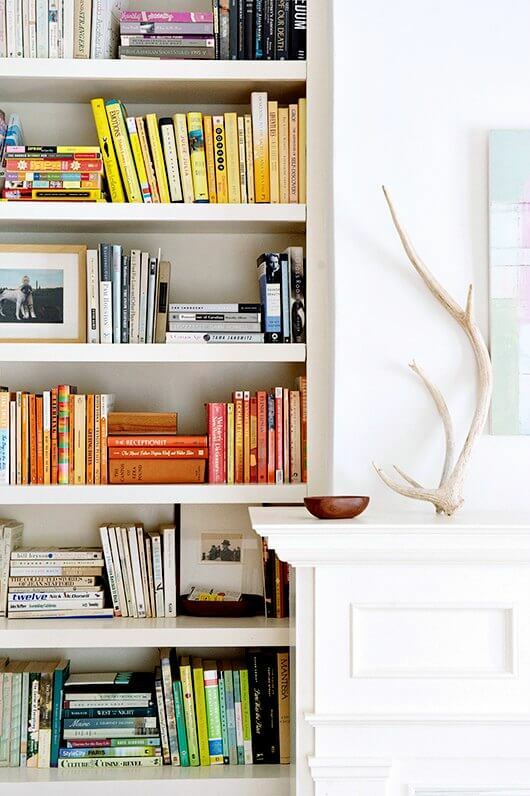 And if your bookshelves are bland or they often go unnoticed, adding a pop of color draws the eyes in. 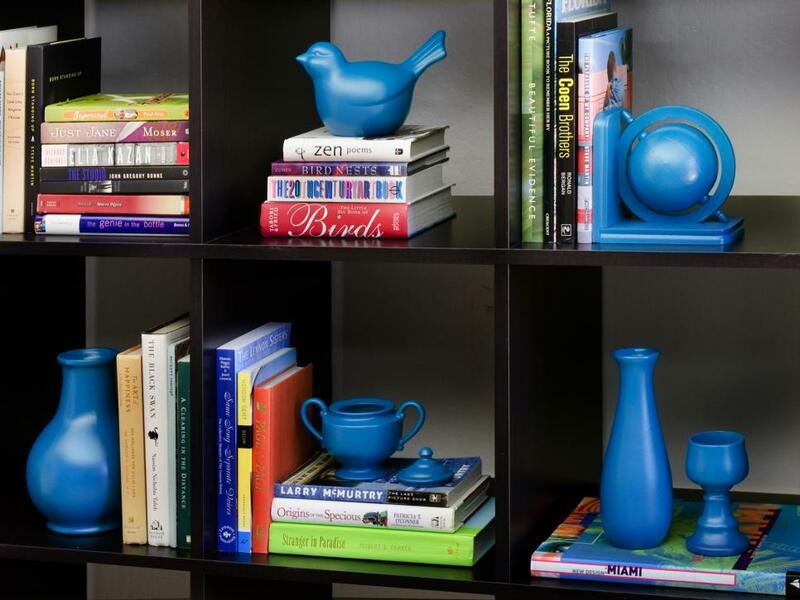 The splash of color makes the bookshelves a standout feature of your living space. As far as styling goes, one of my favorite small apartment ideas is to layer the decors to add depth to a space and create an elegant, “collected” look. Here’s an idea: try incorporating eye-catching shapes in the background and foreground of the bookshelf by using artworks and accent pieces. Arrange the items this way: place the artworks towards the back and the accent pieces or small items to the front. You can also use smaller framed artworks and large accent pieces. Prop the small artworks on the shelves then place the large accent pieces in front. And speaking of artwork, you can use paintings, prints, painted ceramics, or even patterned pieces of fabric to make your bookshelves pop. 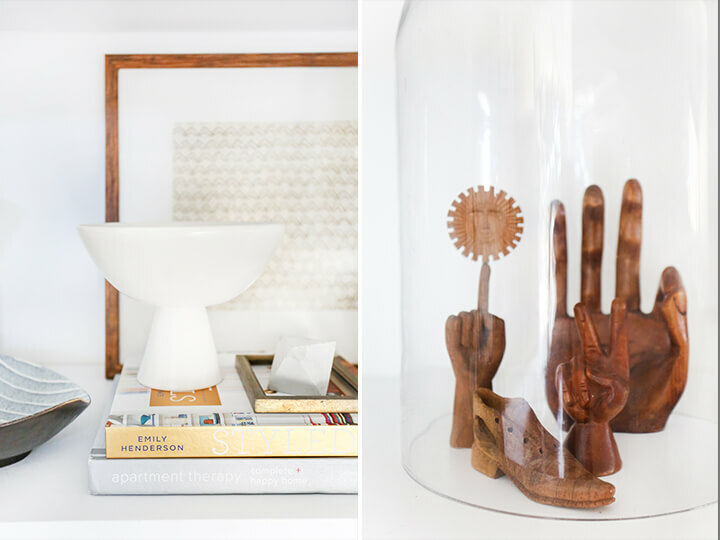 This goes no matter what shelf you have, a little art instantly highlights a space. The key here is to select tasteful pieces. Do not overwhelm the space with too-busy patterns or the bookshelves will look chaotic. When it comes to book placement, try stacking the books horizontally and vertically. You can also stack the books in both directions on a single shelf; the choice is up to you. Try placing a horizontal stack in the center of the shelf and a vertical stack to the right or left. 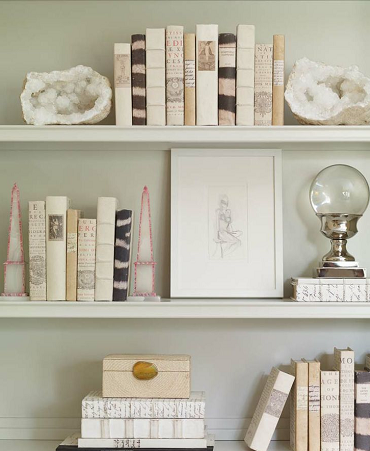 Add a little space in between the stacks of books for the ornamental objects. Place a small decorative object – such as a brass ornament – on books stacked on their sides. 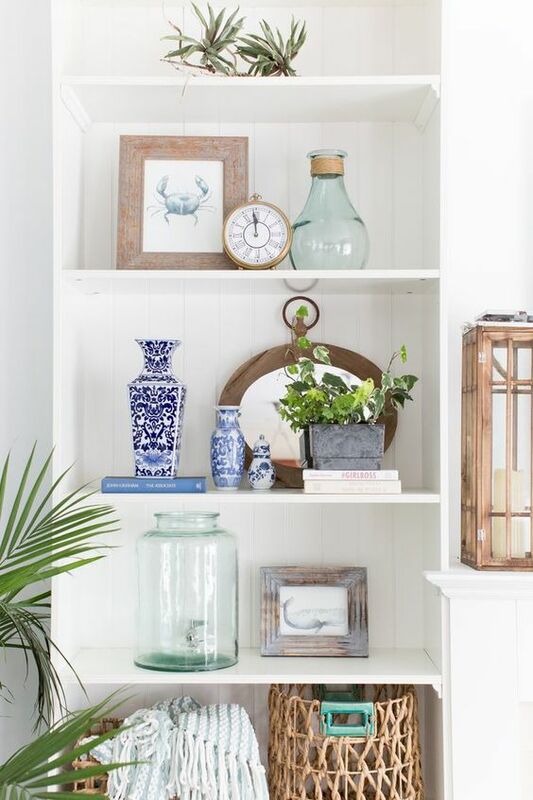 For the vertical stack, place another curio item on the side to create a layered effect. 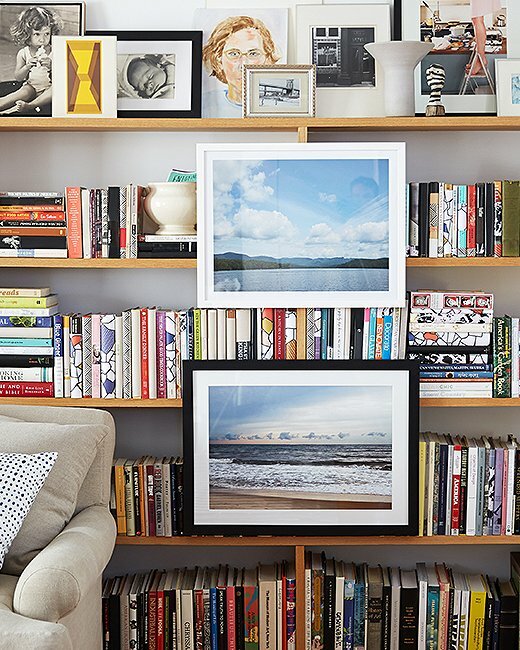 You can also use framed artworks to style the piles of books. 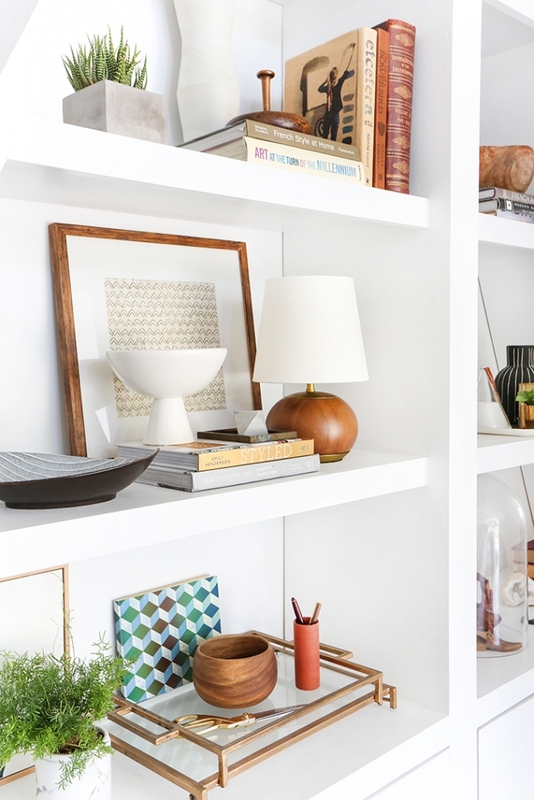 If say, your bookshelf is packed and there is no room for curio items or decorative objects, try this trick: Hang an artwork on the front of the shelves. Use artworks with interesting details, such as a gilded frame, eye-catching graphics, etc., to make the artworks an important detail of the bookshelf. 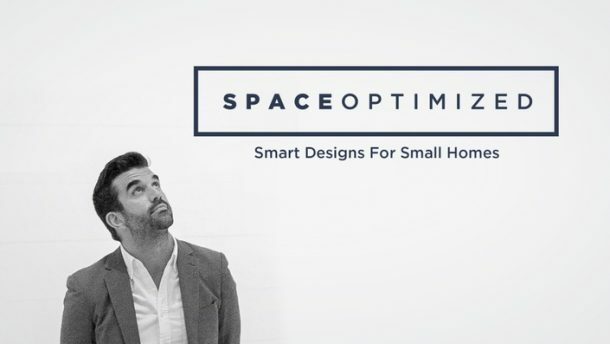 Avoid dead space by filling these spots with small accessories but try not to overdo it. Every time you add a decorative item on the shelves, take a step back to check how the whole thing looks from afar. See where the eyes are drawn. Spread the materials evenly and play with different heights and textures to create interesting details. 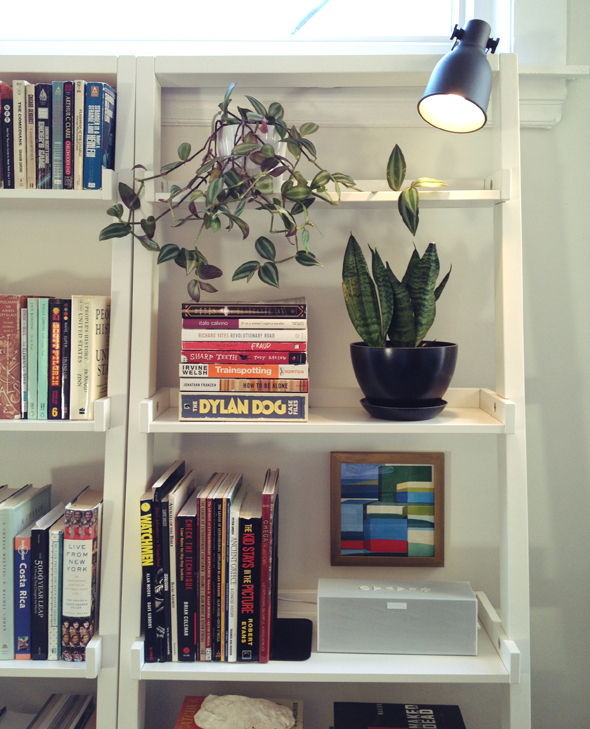 Brighten up your reading space with a couple of houseplants. Incorporate small pots of plants into the design so the space looks cozy, fresh, and alive! This is also a great trick if you’d like to add texture and organic accents to your home. You can use real and faux houseplants; it doesn’t matter as long as the plants aren’t overwhelming the space and are complementing the style. Succulents, tiny terrariums, some climbing plants, and ferns are just a few of the many types of houseplants you can use to up your bookshelf style!